Singapore, 15 September 2011 – With 10 days to the biggest motorsport event in Singapore, Race Promoter Singapore GP suggests useful tips for ticketholders to make the most out of the 2011 FORMULA 1 SINGTEL SINGAPORE GRAND PRIX. Non-stop entertainment from 3PM – 12.30AM. You don't have to wait until dusk to start enjoying the Singapore Grand Prix experience. The Circuit Park gates open from 3pm to 12.30am daily. If you're looking for an adrenaline rush, two support races - the JK Racing Asia Series and the Porsche Carrera Cup Asia - will take place on the Marina Bay Street Circuit before the Formula One action*. Besides these, there is plenty of entertainment off the track as well! Be sure to check out the seven stages across the circuit park where all-day entertainment will be provided. And if that isn't enough, look out for the captivating roving acts like the Brazilian Samba girls, Transe Express or the Jaipur Maharaja Brass Band. *(Click here for full track schedule). Tune in to 107.7 FM and stay connected on Twitter & Facebook. Stay connected with the latest track action by tuning in to 107.7FM. Once you're within the Circuit Park, this radio frequency would be broadcasting live commentary of the Formula One and support race action to you through your own radio receivers. Also get live broadcast visual feeds, instant replays, watch interviews, team and driver data, statistical analysis and many more in the palm of your hands anywhere in the circuit by renting a FanVision set. To find out more, visit the Fanvision booth at Esplanade Park (Zone 4) or F1 Village (Zone 1). Social media addicts can also get real time updates on all the activities around the circuit park as well as tips from other like-minded fans, by following us @F1NightRace on Twitter or joining the 62,000 fans of our Facebook page https://www.facebook.com/SingaporeGP if you have not done so! The heat is on during the race weekend, thanks to the sizzling action on track and the tropical weather in Singapore. Although it is a night race, the gates open well before that with lots of activities throughout the circuit park during the day, so you have lots of ground to cover! Put on your summer gear, apply sunscreen and be sure to wear comfortable walking shoes as you explore the Marina Bay Street Circuit. Bring the right tickets for the right day. Tickets to the 2011 FORMULA 1 SINGTEL SINGAPORE GRAND PRIX are colour-coded for each day. Do ensure that you bring along the correct pass for each day before making your way to the circuit park. Public transport is the best way to go. Give your car a break for the weekend. Despite the road closures, the Marina Bay Street Circuit is easily accessible by public transport. Train services are extended until 1.00am from Friday, 23 September to Sunday, 25 September. Travel light and don't bring prohibited items. Keep your bag as light as possible. Carrying a small bag with only the necessary items will help you pass through the security clearance at the gates faster. Do note that there is a list of prohibited items, which can be found on https://www.singaporegp.sg/download/General_TnC.pdf (Clause 8). As there are no lockers to store prohibited items, make sure you do not have these in your bag before your leave home. Pick up a Survival Kit. The event goes on rain or shine so get yourself prepared with a survival kit which contains a poncho and a pair of earplugs for just S$2. Proceeds go to two charities - the Singapore Red Cross Society and St. John Ambulance Singapore. Survival kits can be purchased at all entry gates. The Circuit Park is divided into four zones, with each having its own entertainment as well as food and beverage offerings, so do get a map at the entry gate or from the ushers and familiarise yourself with what each zone has to offer. Walkabout ticketholders, check out the splendid views of the race action from the various bleachers located along the track! Over at Zone 4, walkabout ticketholders looking for a breezy area should head to the Esplanade Bridge. "Standing closer to The Fullerton Hotel will give u the chance to see the cars make the turn and feel the power of the F1 cars speeding up," says student Candy Lee, who witnessed "quite a few oversteers" there. World-Class Entertainment at Padang Main Stage. Did you know that the largest of our seven stages, the Padang Main Stage can fit 41 Formula One cars? This massive stage will host sensational Korean trio, GD & TOP and SEUNGRI from BIGBANG and Glee-starlet CHARICE on Friday, global mega star SHAKIRA on Saturday and multi-award winning rock band LINKIN PARK on Sunday. 2,000 Fan Zone wristbands will be given out from 3.00pm on Friday, Saturday and Sunday on a first-come-first-served basis at the side of the stage along Connaught Drive. The collected wristbands will only be valid for the day. Theatre performances not to be missed. From Broadway to Bollywood, we have it all covered! If it's humour you're after, catch Forbidden Broadway at Village Stage (Zone 1) on Friday and Esplanade Outdoor Theatre (Zone 4) on Sunday as they reenact spoofs of Broadway classics. If you would like to enjoy some song and dance, "Jaiho" along with the cast of Bollywood Express at Esplanade Outdoor Theatre (Zone 4) on Friday and at the Village Stage (Zone 1) on Saturday. Supersized food and beverage options. Indulge in the plethora of wine and dine options available from 59 outlets across the Circuit Park. On the menu is International cuisine from America, Australia, India, Italy, Middle East, Persia, Singapore and many more. 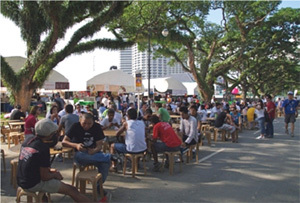 At the Hawker Village in Zone 4, take a break from the action and dine under the canopy of trees at the Connaught Drive. Expect delicacies from renowned outlets including Shiraz, Al Dente, Barossa, Go India Express, Peach Garden, The Mexican, Quiznos, Kazbar and Go-Go Franks. In addition, an array of Singapore-style seafood dishes will also be available in Zone 1. Race fans can sample local specialties such as Barbecued Seafood and Chilli Crab Claw served with Deep-fried Buns from TungLok. Another new addition for this year is the Singapore Street Food @ Bay located under the Bay Grandstand. Patrons can savour Kampong Mee Siam, Shrimp Paste Chicken, Vadai and more from Kriston Food & Beverage. Do note that most outlets accept cash payments only. You can leave and re-enter the circuit park at any time as long as you have your ticket with you. As high human traffic is expected at the vicinity, do make sure you allocate enough time to get back to the Circuit Park for the race. Free rides on the Singapore Flyer (exclusive to Zone 1 patrons). Get an unparalleled bird's eye view of the Marina Bay Street Circuit from 165m above the ground with a free ride up the Singapore Flyer. Unlimited rides are valid for all Zone 1 and Premier Walkabout ticketholders. There will be dedicated express lanes open to Formula One Paddock Club™ and hospitality suite patrons. Tim Neale from the United Kingdom suggests Zone 1 ticketholders should "take the Singapore Flyer during a session when the Formula One cars are on track for awesome views of the cars as they speed down the start/finish straight." Business as usual for stakeholders in vicinity. Retailers at the Esplanade located within the Circuit Park will carry on business on usual. The food outlets located at the Singapore Flyer including Popeyes, Ya Kun Kaya Toast and the hawker-style Singapore Food Trail will also be open to ticketholders. Businesses at malls located right outside the Marina Bay Street Circuit like Marina Square and Suntec City will also not be affected, allowing you to continue shopping and dining at your favourite malls before entering the Circuit Park! Last year, over 82,800 glasses of beer were served to the hospitality guests alone. This year, Singapore GP has upped the ante by introducing new concept bars throughout the Circuit Park. Tiger Beer will deliver an unforgettable experience with their newly introduced 'Bartainer' and a unique brewery tavern bar. Also available elsewhere are two Margarita Bars, six Grid Bars and the Coates & Ice Cold Beer bar that has become a popular feature in Zone 1. Bring a piece of Formula One home. Formula One team memorabilia will be available for sale at the F1 Village (Zone 1 & Zone 4). There are also merchandise booths that dot the circuit park where exclusive 2011 FORMULA 1 SINGTEL SINGAPORE GRAND PRIX merchandise will also be sold. Outside the Circuit Park, merchandise will also be available for sale at selected World of Sports outlets and the Podium Motorsport outlet at the Fairmont Hotel atrium. Do visit www.singaporegp.sg for the full list of retailers. New for this year, selected parts of the track will be open for ticketholders to access after the final track activity until 11.30pm on Friday and Saturday, and until 12.00am on Sunday. This is to enable spectators to experience the Marina Bay Street Circuit up-close and to provide Zone 1 with an alternate route to catch the entertainment acts at the Padang stage in Zone 4. The quickest way to the Padang would be to walk on the track in front of the Bay Grandstand through a temporary/controlled opening at Turn 20, past the Esplanade Outdoor Theatre and the Esplanade Park. You wouldn't want to go home without capturing memories of the world's only Formula One night race and the larger than life art work around the circuit park, so make sure you bring your camera along! For starters, there's the spectacular recreation of 10 planets as high as 5metres, which will be illuminated in Zone 1. Also not to be missed are the life-size driver cut-outs placed around the Circuit Park where you can have some fun posing and taking photos with. Don't forget there are also performances throughout the circuit park by artistes like RICK ASTLEY, BOY GEORGE and SHAGGY, mesmerising roving artistes and thrilling race action throughout the weekend. For the enjoyment of other spectators, do note that tripods and monopods will only be allowed in the general walkabout areas and not into the grandstands. Turn 5 is recommended as a good spot for photography by second-time ticketholder Tim Neale, who says "The cars are coming directly at you before they turn into the corner. Remember to wear earplugs as the driver will hit the gas at the exit of the corner. The Formula One engine screams to 18,000rpm and it's shatteringly loud!" To add to the festival atmosphere, there will be several displays of fireworks so get your cameras ready! Bay Grandstand ticketholders will be treated to a pyrotechnics display at the end of each Ocean Symphony performance at the floating platform on Friday and Saturday. On Sunday, be sure to set your sights on the Marina Bay skyline as there will be a spectacular fireworks display after the race. Look out for the tattoo tents at the Padang and Zone 1 and get inked by our team of temporary air-brush tattoo artists. There are several race-themed temporary tattoos to choose from, and best of all, they're free for ticketholders! Speaking of brushes, check out Brian Olsen's amazing technique of painting iconic personalities using up to six brushes at a time over at the Marina Stage in Zone 1. Returning spectator Greg Lynas advises avid shutterbugs to "use the practice and qualifying sessions to get up close to the barricades in Zone 4 for some good photos - best when the cars aren't going top speed! And take earplugs for when you're not listening to the commentary." If you prefer to relax under the stars and soak in the electrifying night-race ambience, mother of 3 Lorinda Lee who has been to the Singapore Grand Prix twice says "My kids and I always make it a point to have a picnic on the Padang on race day. We love lying on the grass, catching the action on the big screens and hearing the cars zoom by".